Are you a chocolate-peanut butter fan? These Chocolate Peanut Butter Caramel Bars are a dream come true! I was late to the chocolate-peanut butter bandwagon, but once I was converted, there was no going back. My oldest two children have joined me in this…err…addiction, but the hubby and youngest are still not on board. No worries, though; it just means more for me! Nothing better than a batch of classic peanut butter cookies. And since I also adore caramel, these bars with the perfect way to get a triple fix. 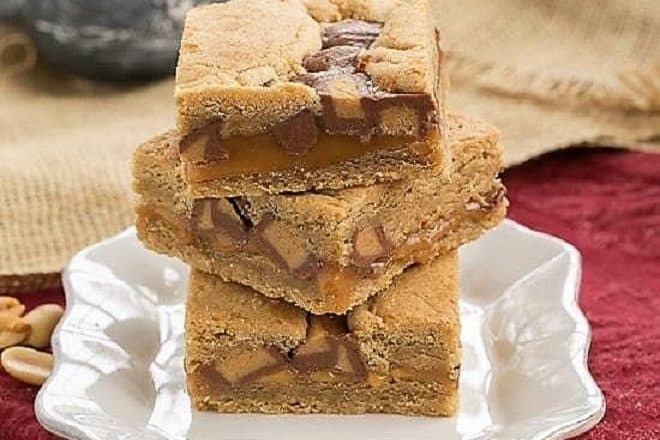 These Chocolate Peanut Butter Caramel Bars are composed of peanut butter dough drizzled with caramel, then topped with chopped peanut butter cups and more cookie dough. Are you sold yet? If you’re another chocolate peanut butter aficionado, you’ll love what I have in store for you! Today marks the beginning of the best day ever – it’s Chocolate Peanut Butter Day! Hosted by Carla of Chocolate Moosey and Miriam of Overtime Cook. 31 bloggers are sharing favorite chocolate peanut butter recipes, ranging from cookies and bars to scones and muffins. Follow the hashtag #chocPBday on social media and join us with your favorite chocolate and peanut butter recipes. Looking for recipes all in one place? Follow our Pinterest board. We are also teaming up with OXO, King Arthur Flour, and Peanut Butter & Co. to bring you three fabulous prize packs. If you love to bake, you don’t want to miss entering. More Chocolate Peanut Butter Desserts! You are more likely to see Katie with a box of Girl Scout cookies or bag of chocolate sandwich cookies than many of my desserts. She takes after you know who! But She loved these gooey gems. Preheat oven to 350º. Line 9 x 13 pan with nonstick foil or regular foil followed by spraying with non-stick cooking spray. In a mixer, combine brown sugar and brown butter beating until creamy. Add vanilla. Beat in eggs one at a time, beating well after each addition. Mix in peanut butter until smooth. Add the flour, baking powder and salt to peanut butter mixture and gently mix till just combined. Stir in chocolate chips. Grease a 9×13 pan. Spread half of the dough onto the bottom of the prepared pan. In a microwave-safe bowl, melt caramels and heavy cream, stopping and stirring at one-minute intervals until completely melted. Stir until smooth. Pour caramel onto the bottom layer of bars. 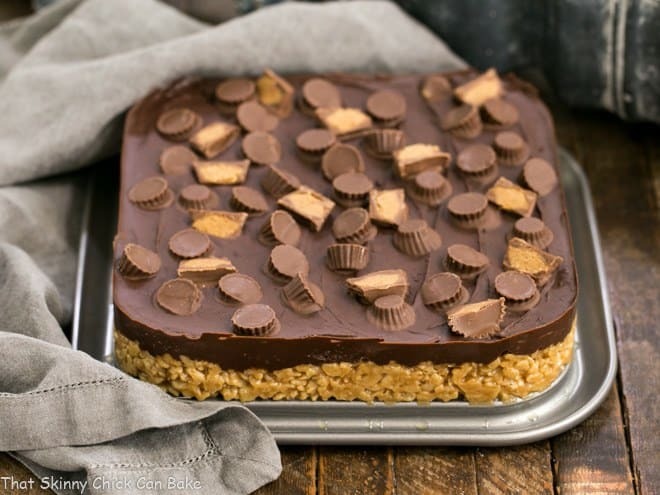 Top with halved Reese cups. Drop remaining dough onto peanut butter cups and carefully spread using your fingers. Recipe inspired by Tanya of Lemons for Lulu. So glad you are embracing this addiction ;). These bars look incredible, I love that ribbon of caramel throughout! Liz, these look absolutely fabulous!! Bookmarking! Lizzy, I am sold and I totally surrender to this indulgence! Your bars look terrific! If I must tell the truth…My favorite peanut butter and chocolate treat is a huge scoop of Skippy’s (creamy of course) with a sprinkle of dark chocolate chips! Ice cream with Peanut butter cups and caramel of course! You had me with the first photo! These look so unbelievable! I can wait to try these!! Mmmm pinned for sure! 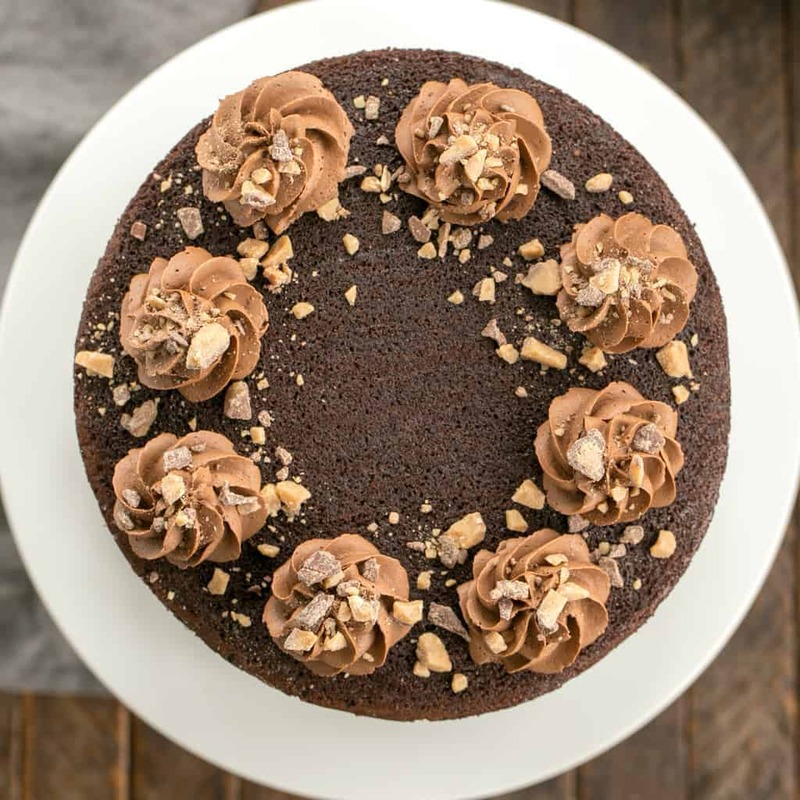 OK – the fact that your Chocolate & PB Day creation includes caramel (swoon!) and your last post was shrimp…tell me we would be fast friends! Yum! lizzy my mouth is watering. I can not tell you how satisfying and delicious this looks! Chocolate peanut butter = Reese’s to me!! You totally had me at caramel and Reese’s. I am loving these amazing looking bars…now if only they were right in front of me!!! Chocolate and peanut butter AND caramel! I love that you kicked it up more than just a few notches with the caramel, Liz! I am sooooo thrilled you joined the chocolate/PB lovers world and I love your caramel addition, too!! Your cake looks wonderful! Love that thick layers of peanut butter frosting. Yum! I think my fav. choco. peanut butter treat is peanut butter filled cream sticks with choco. ganauche. This is the best day ever. You always make the most dense looking bars full of yummy goodness. Peanut butter and chocolate makes me weak in the knees and you go an add caramel too! 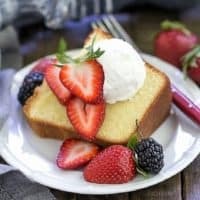 I’m so glad you did hop on the bandwagon so you could join us today and share this fabulous recipe. Wow, these look delicious! My kids would love them! Happy Chocolate Peanut Butter Day, Lizzy! ^_^ These bars look irresistible…I have weakness for caramel so needless to say I wouldn’t be able to control myself around these. These look wicked delicious. I can’t believe there are people out in the world that are still not on board with pb and chocolate. Wha? You might have been late on the bandwagon but wow are you in the vanguard now! I’m not the world’s greatest peanut fan but this would tempt even me. Mouthwatering photos! Oh yum Liz, I saw these of G+ this morning and they looked amazing. I love the layered effect of all the goodies! 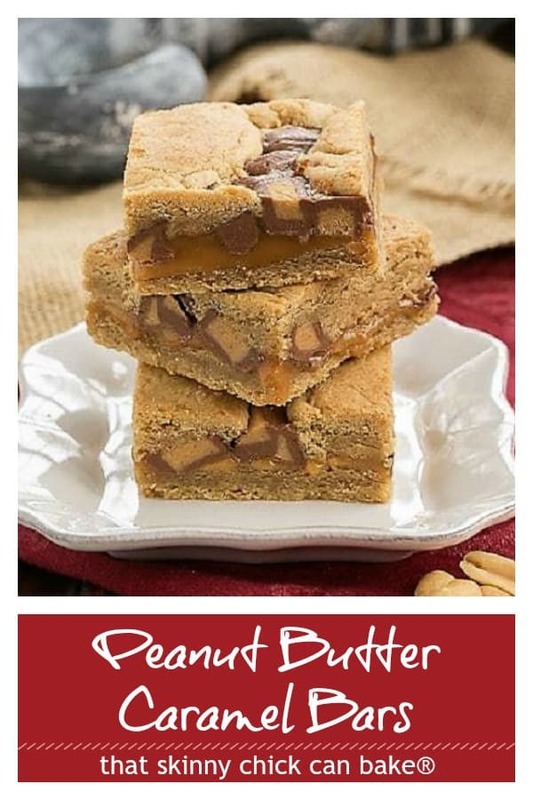 I think my new favorite chocolate-peanut butter treat are these Chocolate Peanut Butter Caramel Bars..! These look amazing. Chocolate and peanut butter will always be high on my list of treats! I love the sound of these, so indulgent! juuuust kiddingggg–more of these yummy bars for the smart people!!! I love that you added in that gooey, chewy, caramel layer! You and these damn bars. With chocolate and peanut butter and chocolate and caramel. Each one is better than the next! We were definitely on the same page using caramel with the peanut butter and chocolate! Good golly, oh how delicious! 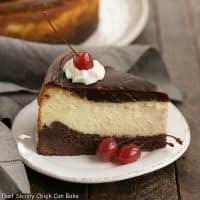 🙂 all we need now is some of my Hot Fudge Sauce on top and a spoon! Cereal peanut butter bars. It like a Rice Krispie bar bit it has peanut butter and melted chocolate chips swirled in. Well, I do like a Chocolate Chip Peanut Butter Cookie, but your bars look pretty fantastic too. What an amazing looking cookie bar! 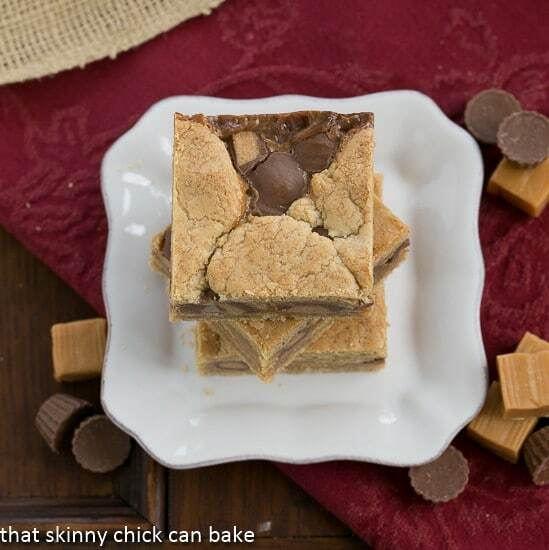 I love the layers of caramel and the chunks of Peanut butter cups all combined into one fabulous treat! You added my third favorite thing (caramel) to my top two favorite things (chocolate & pb) – AMAZING! 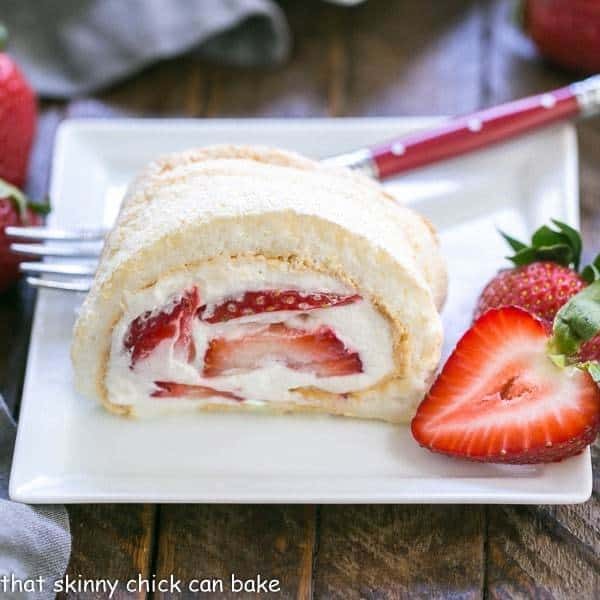 Your blog title is perfectly fitting today, Liz… that skinny chick really CAN bake! Ohhhhh, I love these! “Oh my goodness,” first words out of my mouth! i think i might make these my favorite choc and peanut butter… it used to be Reeses candy cups but these sound wonderful…….. These bars look delicious. They’re cut perfectly too. Thanks for the great giveaway too. Peanut butter and chocolate…what’s not to love them! They look scrumptious, Liz. These bars look so delicious and yay for PB and Choc Day!!! I’ll jump on that bandwagon with you. My husband won’t eat caramel OR chocolate and peanut butter together. All mine!! GUHHH, those looks amazing! Caramel is the devil. A sweet sweet devil! I always seem to go back to Reese’s peanut butter cups. Oh Liz, you always bring the best things to the table! These bars are incredible and they’re filled with everything that I love to eat in the world: chocolate, peanut butter and caramel. I’m going to pin these tonight so that I save this recipe. This has to happen in my life asap! Everything you make looks perfectly gorgeous and delicious! Love this! That makes me crave a Reese cup! Ahhh Liz… I am just in love with all of your lovely bars! 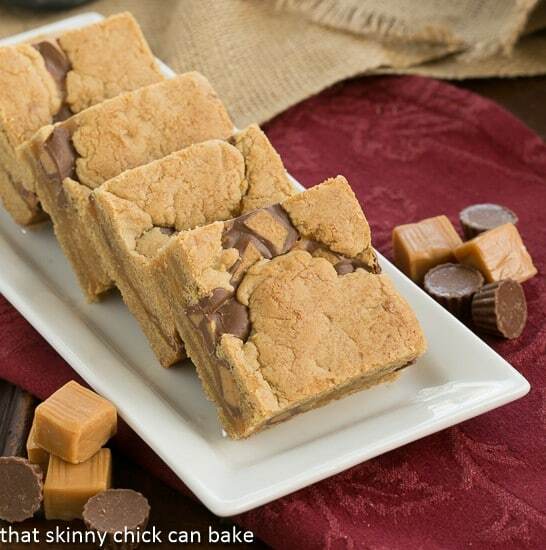 You make it so perfectly and just amazed with the combination and different types of bars you bake…. Wonderful! These peanut butter bars look so amazing – love all the caramel! I am craving these now, for lunch! Love the addition of caramel in these Liz. These three together would be like the 3 Musketeers. Unstoppable! Chocolate Peanut Butter Day? I’m in! Love that flavor combo. And with caramel? Swoon! Really nice — thanks. Happy Chocolate Peanut Butter Day! 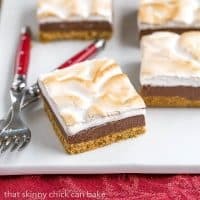 I love these cookie bars–great contribution to the day! Your recipes are always a feast for the eyes as well as a feast for the taste buds. Yum! These look crazy good, Liz. Love the caramel to add some chewy gooey texture! I love chocolate and peanut butter the best. When I was a kid I tried to get my mother on the chocolate peanut butter addiction but she wouldn’t buy it. She never was a chocolate lover which make me wonder where I came from. 🙂 That was mean of you to add the caramel because it now makes these bars irresistible! These bars are absolutely perfect Liz! Do you deliver overseas? I need to try these using the browned butter. I can’t stop drooling! Yes I am sold, these look so tempting! Your bars look soo good. I like how you’ve added caramel into these. Mmm it’s making me hungry for some right now! My fav- is….. I don’t know- I can’t choose! Anything with Chocolate and Peanut Butter is fantastic! 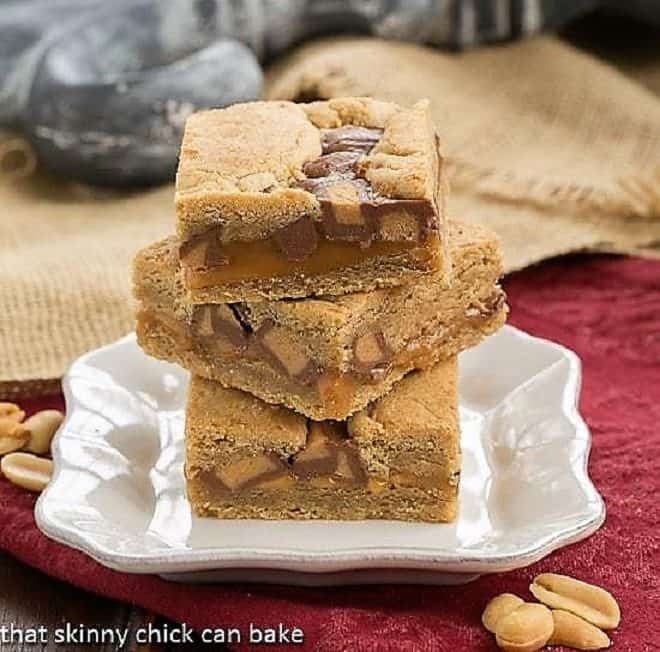 Seems you are an expert on making bars 🙂 … so whenever I am craving for some I know where to come and get a good recipe. These are looking lovely as always. No fair Liz! Enticing everyone in with your caramel like that! What a great addition to our regular chocolate peanut butter recipes! These bars look perfect! I can’t imagine anyone NOT liking the chocolate and peanut butter combo. I mean, I pretty much have a jar of peanut butter, and use a bar of chocolate as an “edible spoon” so to speak. SO good! My favorite chocolate-peanut butter treat is a Reese’s Peanut Butter Cup. Chocolate and PB on graham crackers and topped with swirls of white chocolate! YUM!!! ::sigh:: I have to admit that I’ve avoided this post. I just want that whole pan. I don’t even care about the chocolate in there. I love blondies, I love caramel and I enjoy peanut butter. Putting the three together is an awesome idea. I am not a peanut butter — but one of my son’s is. And he’s not picky! Is it bad that I just want to get a spoon and scrape out the center of these bars?! Mmm if there’s thing that can make these chocolate peanut butter bars better, it’s caramel. Oh my I think I have fallen in love! These look super and they have everything in them that I am addicted to peanut butter, chocolate and caramel. Oh my Liz you are making my waistline expand! These look amazing! I love the chocolate peanut butter combo! I’m not here for the win, just to tell you that these bars look FABULOUS !! I made these for Teacher Appreciation….. What a success!!! Thanks so much!! We have a WINNER!! Thanks so much for the feedback, Beth! Glad they enjoyed!!! Omg drooollll! This page needs pinning, big time! How on earth did I miss these when you first posted them. These look and sound so worth the calories. Saving the recipe. my kids will love these bars all 3 of their favorites in one bar thats if I can get them away from my husband! I made these on Sunday. I was snowed in and wanted to bake. So amazing! I love them! These bars are calling my name! I love the flavor combination! These were really amazing! Such a delicious treat for everyone!